Today it is time to proudly present the latest member of the Rude family of apps: Rude Rhythm! 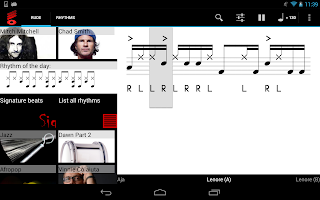 Rude Rhythm is the drumtrainer app for both beginners and pros. For the beginning drummer this app provides exercises and basic beats in all styles. Daily inspiration and new ideas in an easy, fun format. Practice makes perfect - and this is the perfect practice metronome. The seasoned pro will appreciate having Rude Rhythm as a reliable rhythm reference. Good grooves, always in the pocket. So, the chart calls for a mambo? Check! Need a fresh variation of latin funk? Got it! Find an original sounding afropop? Consider it done! Rude Rhythm contains over 300 different drum set beats in all styles, from metal to polka. Hundreds of magazines from several decades has been used to find classic examples of all styles, the best websites has provided up to date ideas and more are added all the time. This is an ever expanding encyclopaedia of rhythms. ...and the list goes on and on. Got suggestions for styles or drummers that are missing? Send a mail and we will do our best to add it quickly! The playback engine is custom made for this app, and based on the most accurate metronome on the market. Slow down a tricky rhythm while practising. Speed it up as you learn. This drum coach goes from 20 to 240 BPM with perfect audio quality. And it's no simple midi drum machine, but a real sample player. All drums are professionally recorded, providing a wide variety of sounds. Several great sounding, complete kits are included. Rude Rhythm is easy to use, with crisp and clear graphics in all resolutions. 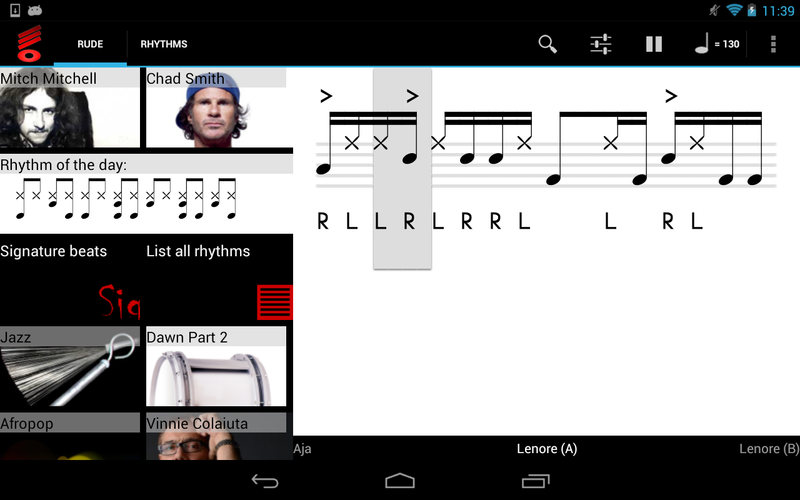 Search and browse, flip quickly between rhythms also while playing. The app works equally well on phones and tablets. Still it is small (only about 4 MB including all images and sounds! ), requires no strange permissions or Internet access. Go get it. And then go play!